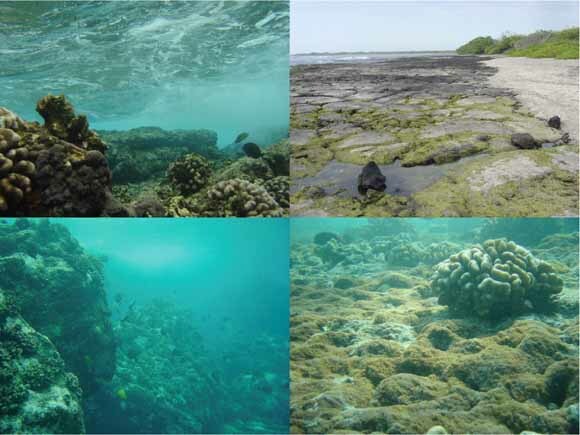 The aquatic resources of Kaloko-Honokōhau National Historical Park, including rocky shoreline, fishponds, and anchialine pools, provide habitat to numerous plant and animal species and offer recreational opportunities to local residents and tourists. A considerable amount of submarine groundwater discharge was known to occur in the park, and this discharge was suspected to influence the park’s water quality. Thus, the goal of this study was to characterize spatial and temporal variations in the quality and quantity of groundwater discharge in the park. Samples were collected in December 2003, November 2005, and April 2006 from the coastal ocean, beach pits, three park observation wells, anchialine pools, fishponds, and Honokōhau Harbor. The activities of two Ra isotopes commonly used as natural ground-water tracers (223Ra and 224Ra), salinity, and nutrient concentrations were measured. Fresh ground water composed a significant proportion (8–47 volume percent) of coastal-ocean water. This percentage varied widely between study sites, indicating significant spatial variation in submarine groundwater discharge at small (meter to kilometer) scales. Nitrate + nitrite, phosphate, and silica concentrations were significantly higher in nearshore coastal-ocean samples relative to samples collected 1 km or more offshore, and linear regression showed that most of this difference was due to fresh ground-water discharge. High-Ra-isotope-activity, higher-salinity springs were a secondary source of nutrients, particularly phosphate, at Honokōhau Harbor and Aiopio Fishtrap. Salinity, Ra-isotope activity, and nutrient concentrations appeared to vary in response to the daily tidal cycle, although little seasonal variation was observed, indicating that submarine ground-water discharge may buffer the park’s water quality against the severe seasonal changes that would occur in a system where freshwater inputs were dominated by rivers and runoff. Ra-isotope-activity ratios indicated that the residence time of water in the coastal ocean at the study sites was less than 1.6 days. We calculated water and nutrient fluxes into the coastal ocean at each study site. This study provides a baseline description of submarine ground-water discharge in Kaloko-Honokōhau National Historical Park and its effect on the park’s aquatic resources. We hope that it will allow park managers to better assess potential future changes in ground-water quality and quantity and conserve the park’s valuable resources. Download this report as a 38-page PDF file (sir2008-5128_text.pdf; 6.4 MB). View the Appendix files. Appendix 1 is a full listing of all samples collected for this study. It is presented here in both .doc and PDF formats (appendix folder; 2 files, 2.7 MB total). View the Metadata files. The metadata are presented here in faq.html, .html, .txt, and .xml formats (metadata folder; 4 files, 136 kB total). For questions about the content of this report, contact Karen Knee or Eric Grossman.